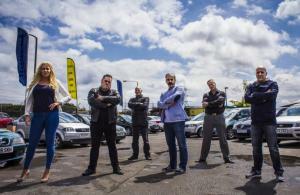 A new motoring show is coming to ITV1 which will explore the world of buying and selling cars. Deals, Wheels and Steals will offer a behind the scenes look at car auctions and how to make a profit from them. It follows six dealers each week as they buy used cars from various auction houses, repair the vehicles to a roadworthy state and then try to sell them on for a profit. While it is unlikely that the show will touch upon some of the less glamorous aspects of the world of motor trade such as obtaining the necessary road risks insurance to enable a dealer to drive the cars it buys from auction, it will nevertheless offer great insight into the car selling process. The ITV commissioned show, which is due to have its first airing at 8pm on 22 September, will feature six 30-minute episodes, Car Dealer Magazine reported. The website also spoke to Jim Lewis, one of the dealers taking part in the show, about what the series has in store for viewers. He explained: "There are about six dealers in the show and we’re all up against each other, bidding on a certain amount of cars. Obviously we have to get cars at a good price, and we do have a little bit of friction between us, but it’s all good off the camera, we all get on, but the thing is we all want to get the best deal and we don’t want other people to try to bid the cars up." Mr Lewis said of the filming of the show: "I absolutely loved it. It’s so good because they’re showing you what goes on when you go to car auctions, exactly how it is at car dealerships and how it works."